A world-weary sigh was the best I could manage on reading that His Royal Highness Charles, Prince of Wales, had written 'a 52-page book about global warming'. Indeed we live in a world full of wonders, but that we should ever see a 'peer-reviewed' Ladybird Book – well, who would have imagined that? 'Peter and Jane play with their gluons'. And even then, how can our limited imaginations cope with the entire Royal Meteorological Society as a peer reviewer? Our imaginations are so stretched that we have to do some fact-checking. Well, off to the Ladybird Books website, they should know. No, can't see it. Try a search: 'prince charles' – 'There are no results matching your request'; try 'prince of wales' – three irrelevancies; try 'tony juniper' (Charlie's little helper) – 'There are no results matching your request'. Hmm… let's leave the monkey and try the organ grinder, Penguin Books. Nothing obvious. Let's try the search again: 'prince charles' – 41 results about the royals and Spike Milligan; try 'prince of wales' – 42 results ditto; try 'tony juniper' – bingo! 'Climate Change (A Ladybird Expert Book)'. Well, at least a book calling itself a Ladybird Book exists with this title, but mysteriously without its principal author. Other titles on subjects such as the Battle of Britain and the Beatles’ Sergeant Pepper’s Lonely Hearts Club Band album will follow. There is no further comment I can make here: in this snowflake age I, too, find myself close to tears. But soft! What is this? Left: Penguin's original design, still on their website as we go to press. Right: the new design according to the Mail on Sunday. 'HRH Prince of Wales' as the new lead author – that will pull in the punters! As far as Penguin Books is concerned this tome was written solely by Tony Juniper (green careerist and ex Friends of the Earth schill of the first chop) and Emily 'hot ice maiden' Shuckburgh (scientist). Our readers who care about such things will note that Emily is 'a fellow of the Royal Meteorological Society and co-chair of their Climate Science Communications Group' according to her British Antarctic Survey page. So, was the co-author also the 'peer reviewer'? Tut, tut. In fact, according to the website metadata, the principal author is Tony Juniper, the same metadata that tells us that this content was last updated on 5 January this year. Things move quickly in the mysterious world of climate change activism. The Mail on Sunday's assertion that 'Prince Charles penned the introduction and co-wrote the 5,000-word book with former Green Party Parliamentary candidate Tony Juniper and polar scientist Emily Shuckburgh' is technically correct, but stretching truth to its outer boundaries. Once at the boundaries, the jump to the title of the piece is an easy lie: 'Prince writes a 52-page book about global warming'. 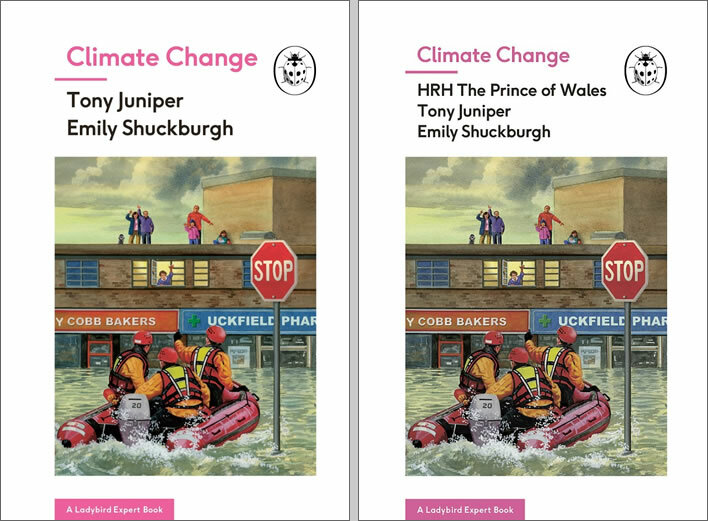 The Prince of Wales has penned a Ladybird book on climate change, a co-author has revealed. Charles, a vocal critic of man-made climate change, has taken on the challenges and possible solutions in the book aimed at adults, according to reports. He wrote the book with Tony Juniper, a former Friends of the Earth director, and Emily Shuckburgh, a Cambridge University climate scientist. The source of the press release seems clear: 'a co-author has revealed'. Press releases and book – all the little helpers were busy on this work of fiction: The crazed propagandist Juniper wrote it, involved Ice Maiden Emily at some point in order to to get a 'climate scientist' on the list of authors, mad Charlie was roped in by Juniper, who, we are not at all surprised to learn, is 'an advisor to the Prince'. According to Penguin, it was mad Charlie who pitched the idea for the book to them. The propaganda model is now clear: Juniper gets a scientist's name, adds a well-placed patron and bang! job well done. A perfect web of lies, half-truths, deception and dissembling from the green blob. Penguin will take the sales hit that will be caused by putting mad Charlie's name on the cover and write it off as the cost of keeping a nob happy. In its article, the Mail on Sunday, to its great credit, does give some balance and alternative viewpoints, but is hampered by the fact that the contents of the book are still a secret. Which fact, in this 'post-fact' age, in itself speaks volumes. Primary cause of CAGW is CO2– rubbish. Retreat of glaciers – rubbish. Demise of Arctic sea ice – rubbish. Coral reefs are dying – rubbish. Risk of flooding and of drought – rubbish. There isn’t a pause – rubbish. Daily weather forecasts should refer to climate change – good grief. Clean-tech industries are beginning to thrive – rubbish. UK derived more than a fifth of its electricity from clean renewable sources in past year – extremely expensive rubbish. A number of Australia's animals are under severe threat from habitat loss due to climate change – rubbish. Global warming will bring flooding to the world’s great cities – rubbish. Big round of applause for Emily and the Royal Meteorological Society, who peer-reviewed this. Give Homewood a gong! Oh, just a minute – that would have to be done through Charlie's mother. Sorry, Paul – reward in Heaven and all that.